U.S. consumers have gone frugal in shopping for consumer goods, a behavior changed by the Great Recession of 2008. This post-recession shopper is also morphing into a frugal healthcare consumer. Being frugal in healthcare is tricky though, and too many people aren’t taking advantage of one of the most useful tools for managing health care costs: the health savings account (HSA). By September 2015, American consumers’ economic confidence level lags at the lower end, the Gallup Poll found (shown in the line chart). The confidence index is calculated based on two questions: how do you see economic conditions in the nation “today,” and do you think economic conditions are getting better or worse? This persistent drop in financial confidence has made American’s more careful and resourceful shoppers and spenders in the consumer goods world. Strategies people use for stretching dollars include couponing, seeking discount prices, crowdsourcing deals in online social networks like Groupon, and buying more store-branded generic products (including generic prescriptions and private labelled over-the-counter products at the pharmacy). 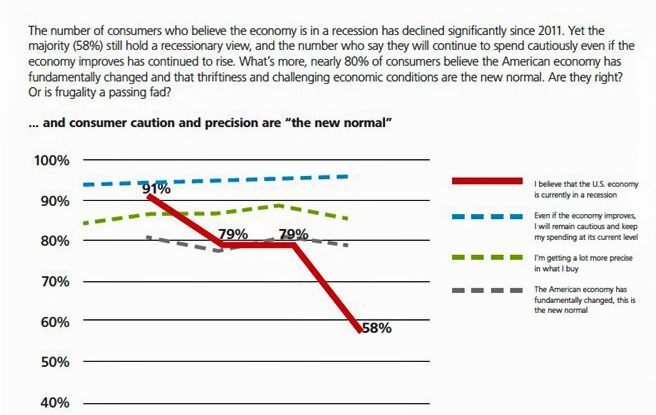 In 2015, some 58% of U.S. consumers still believe that the economy is in a recession, down from a high of 91% in 2011 and 79% in 2014. Thus it is not surprising that 9 in 10 people say even if the economy improves, they will remain cautious and keep spending at their current (lower, disciplined) level, and 8 in 10 people say they are getting “a lot more precise” in what they buy, illustrated by the line chart from Deloitte’s 2015 American Pantry Study. One industry segment getting more precise and cautious in their spending is employers, who continue to offer health insurance at the workplace but are doing so through adopting high-deductible health plans coupled with HSAs. Health insurance premium costs for businesses covering workplace health plans grew 61% between 2005 and 2015; workers’ contributions to the premium increased 83%, during a time when wages stayed fairly flat, with a 10% increase over the five-year period, according to the 2015 Kaiser Family Foundation survey on employer health benefits. Larger firms tend to offer high-deductible plans coupled with a savings option (SO), and HSAs are the fast-growing option for these plans. In 2015, 8 in 10 employers offered some form of account-based health plans – that is any type of health plan coupled with a savings option, including but not limited to HDHPs, projected by the National Business Group on Health (NBGH). NBGH found that HSA enrollment by industry varies. There is greater HSA adoption among workers in wholesale and retail, financial services, and IT and telecomms than – ironically – in public sector education and health care, discovered by the Towers Watson and the National Business Group on Health 2014 employer survey on purchasing value in health care. On the supply side, HSAs are becoming a more prominent feature in health plans at the workplace, and in plans purchased on the public Health Insurance Exchanges. The Medicare Prescription Drug, Improvement, and Modernization Act of 2003 (MMA) allowed for consumers enrolled in high-deductible health plans to open and fund HSAs. HSAs have a triple-tax advantage: contributions reduce taxable income, earnings on assets in the HSA build up tax-free, and distributions from the HSA for qualified expenses are not subject to taxation. Health consumers can take advantage of qualified expenses including most services provided by health providers, along with diagnostic devices, prescription drugs, substance-abuse services and complementary and alternative medicine treatments such as acupuncture and chiropractic therapy. In 2014, only 6.4% of HSA owners had used the investment option portion of the account, the EBRI found. EBRI’s data shows that HSAs with investments have much higher account balances: $10,261 among HSAs with investments versus $1,709 for HSAs without them. That’s because EBRI’s research shows that individuals contributed $2,636 annually on average when they had investments, and less than half that amount – $1,224 – when they did not have investments. Enrollees in high-deductible health plans are less confident in their ability to pay for healthcare were they to become ill. People with the lowest incomes in these plans, the Fund notes, are at greater risk of spending large amounts of income on healthcare, with higher cost-sharing in health plans eroding financial security. Investing even modest amounts in HSAs in this environment could help manage this risk in lower-income communities. Adopting and fully-using HSAs is a triple-tax advantaged benefit that is a missed opportunity for too many U.S. health consumers. Employers, plan sponsors, financial wellness advocates, investment firms and the public sector all play a role in communicating the upside to this benefit – the only such investment vehicle of its kind offered up to American health citizens.